My love affair with Patrick Ness’s Chaos Walking trilogy began with The Knife of Never Letting Go. The next book, The Ask and the Answer was also fabulous. Last night I finished the third book, Monsters of Men. I am not ashamed to say that I cried. Monsters of Men begins on the eve of war. Todd and the Mayor, and Viola and Mistress Coyle are not only at a stand-off with each other, The Spackle (the indigenous people of New World) have risen up to annihilate them. War proves to be frightening and messy and dangerous. 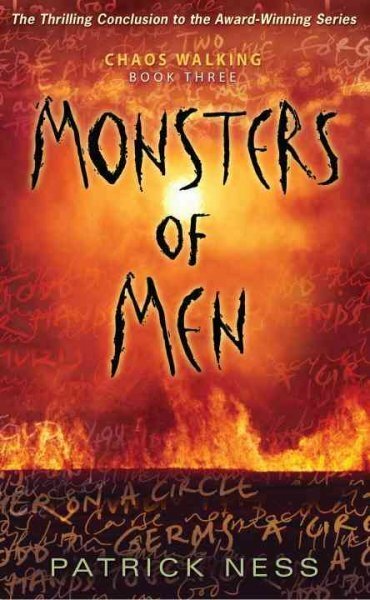 The lines between hero and villain, good and evil, are blurred in Monsters of Men. I found my feelings about the Mayor constantly changing. Is he a decent man caught up in extraordinary times? Is he a master manipulator? Is he a monster? Mistress Coyle didn’t fair much better in my estimation. Viola and Todd ask the same questions about the adults nearest them and as they aren’t physically together for much of this book, they also ask it of each other. How have circumstances changed them? There’s also a new point of view to consider in Monsters of Men: the Spackle. For the first time we get to hear their noise. Truthfully, I found some of this bothersome because of the names they ascribed to things: the Burden, the Clearing, the Knife, the Sky, the Source. I was caught up in the narrative and it slowed me down trying to figure out who or what they were talking about. Nevertheless, the Spackle are no longer a faceless enemy – if they ever were the enemy at all. There are big questions to be considered in this novel, in the series as a whole. Despite the fact that Chaos Walking is marketed as a Young Adult series, Ness doesn’t shy away from asking them. Why do we fight? What does it mean to be human? I even think there is something in the books about this information age – the constant bombardment of data and noise we endure every day. With no quiet space to think, don’t we all have the potential to be driven a little mad? Alternatively, can’t we use this information to better understand and empathize with each other? As the Mayor says to Todd near the end of the book, “War makes monsters of me, you once reminded me.” It is messy business, to be sure. But there is great humanity in these books. And Todd and Viola, as characters, will be with me for a long, long time. This entry was posted in 365 Days 2012, Book Chat and tagged 2012, Book Review, favourite authors, favourite books, highly recommended, teen, YA by Christie. Bookmark the permalink.